The episode was good but the little twist they had were kind of obvious. You could tell Fizel & Linel were probably knights or something of a threat right off the bat considering they had daggers. With Fanatio her build kind of gave a way the surprise, tbh it was more shocking that one of the fodder knights was a female. They could’ve done a much better job with both. The twists were indeed plain to see (those daggers were hard to miss, and even a non-LN reader such as myself assumed the purple knight was a woman) but I wasn’t bothered by either. 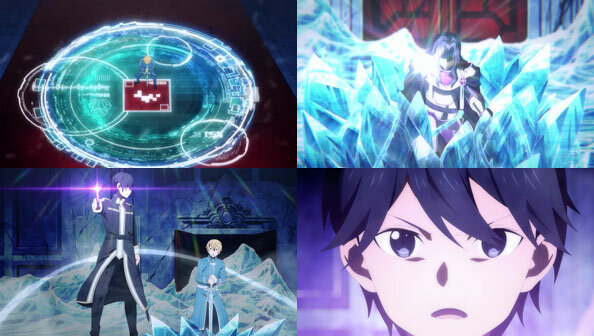 What made this episode must-watch for me was the fact that Kirito and Eugeo simply aren’t messing around anymore–by necessity, considering the power of the I-Knights. They weren’t too bothersome, I just wish they actually tried to hide it. 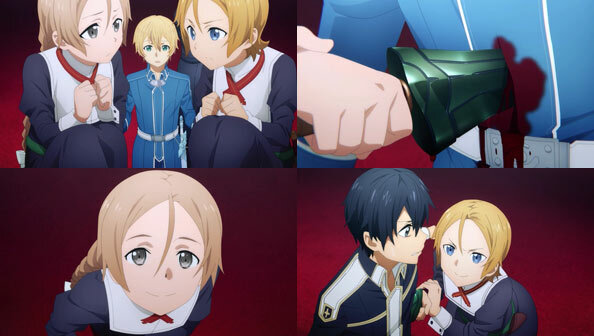 The fact that Kirito and Eugeo are actually having to ho all out is interesting and entertaining but something that’s a little more fun to see is the difference in how Kirito and Eugeo observe things. 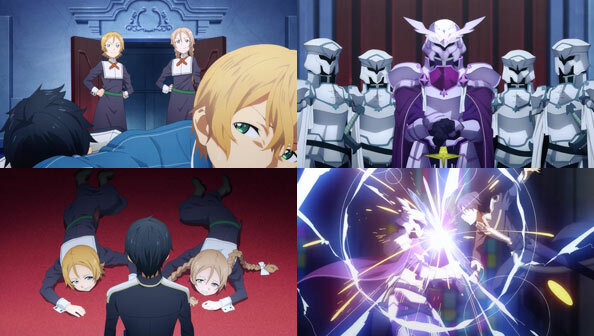 Like with the two girls Eugeo was way too trusting (despite the visible weapons on them and being in enemy territory) while Kirito knew off the bat thet they were a threat and even prepped an anti poison spell. SAO back on track at last! 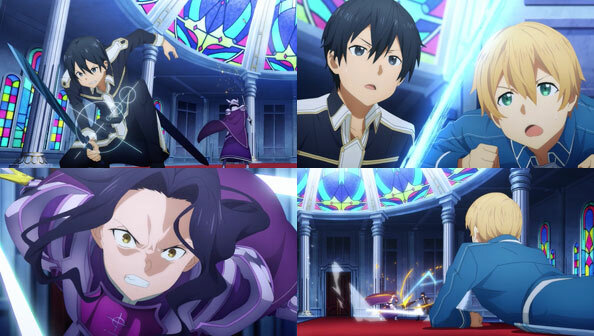 Rushing, slashing, parrying, dodging, and blasting opponents to hell…it’s SAO combat at its best. My only concern is that the battles are already so intense, and SAO doesn’t usually stray into TTGL/Kill la Kill-style chaos…so I’m eagerly awaiting if and how they’re going to stylistically “up the ante” in the many tougher fights to come. SAO already has a higher bar than most shows when it comes to fight choreography. I also thought story wise this was a more purposeful episode than many earlier episodes with Kirito showing more motivation and direction than he has of late. I’m hoping they keep this intensity as the show has lagged somewhat of late.